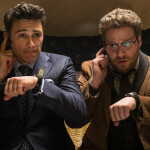 Following recent news that select theaters in the U.S.will be playing The Interview on Christmas Day, YouTube, Google Play, and Xbox Live will officially be streaming the film at 1PM EST later today, Christmas Eve. You can see more streaming options and updates over at SeeTheInterview.com when it’s officially available. Folks can anticipate renting the film for $6 or buying it for $15. No word on iTunes platform as of yet.